Elizabeth Warren is an American bankruptcy lawyer, Harvard Law School professor, and the Progressive Democratic Party candidate in the 2012 United States Senate election in Massachusetts running against Sen. Scott Brown. In her past, she has claimed and or allowed the claim to be propagated that she is Native American so she could gain special advancement as a minority woman. Brietbart Big Government identified that Warren is listed as a 'Woman of Color' by Harvard Journal in 1996. Three years before the Journal, Harvard Law School in 1993 publicly stated she was “a woman of color.” Elizabeth Warren likely made that claim while teaching at Harvard, and at approximately the same time the faculty was considering her for a tenured position. However, her claim can not be validated, and she has been called on the carpet by "angered members of the Cherokee Nation, the tribe to which Warren has attached her undocumented claims." This very white woman has angered people of color, is presently being ridiculed and is backtracking on this issue. This prevaricator neither represents the Cherokee Nation nor the people of of Massachusetts. She should not be representing the people of Massachusetts in the U.S. Senate. Cindi Appleberry, Conservative Daily News: Elizabeth Warren exaggerates heritage to work at Harvard. Lashes out at the rich though she is worth millions. 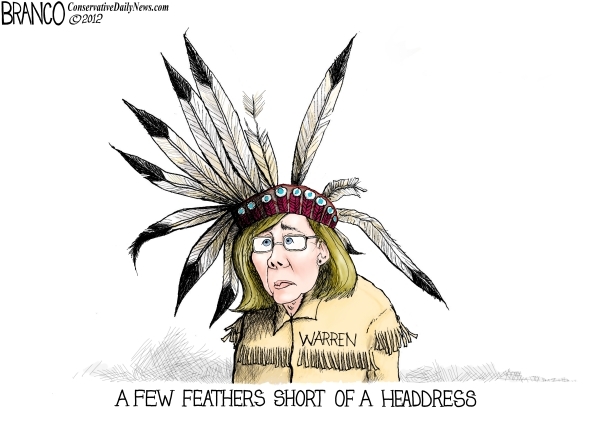 Hypocrite of the nth degree – so why not make an Elizabeth Warren Parody?